Boston Town will be looking to go top of the UCL Premier as they host county rivals Holbeach United tonight. 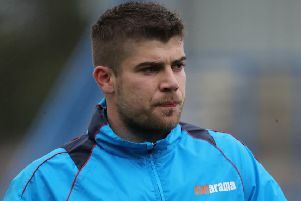 However, they will be doing so without Nick Jackson, who has joined the Tigers after leaving the DWB Stadium. The defender will not feature in tonight’s contest (KO 7.45pm). Mark Angel has bolstered his squad with ex-Louth utility player Danny Stevens, joining from Holbeach, and Romanian Rudi Jencsi, who has received international clearance. Town sit second in the table at present, behind Yaxley on goal difference. The Cuckoos travel to face Sleaford tomorrow.